Bill of Materials Software helps you stay on top of your production planning, purchasing and estimating. 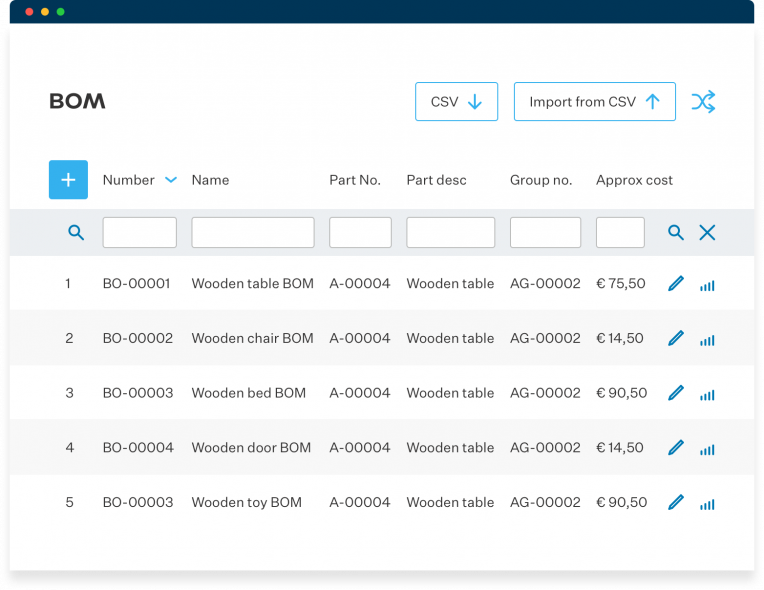 Easily create a BOM of few components or just upload a new engineering BOM from CSV with hundreds of parts. Use a simple, single level BOM, where the products are directly made from raw materials. Use a multi-level BOM for sub-assemblies and Matrix BOM for products with parameters and configurations. Be sure that the used part numbers are correct and there are no errors. Check the availability of materials on inventory and immediately calculate the availability dates of purchased items. Automatically estimate the costs of all materials on BOM. 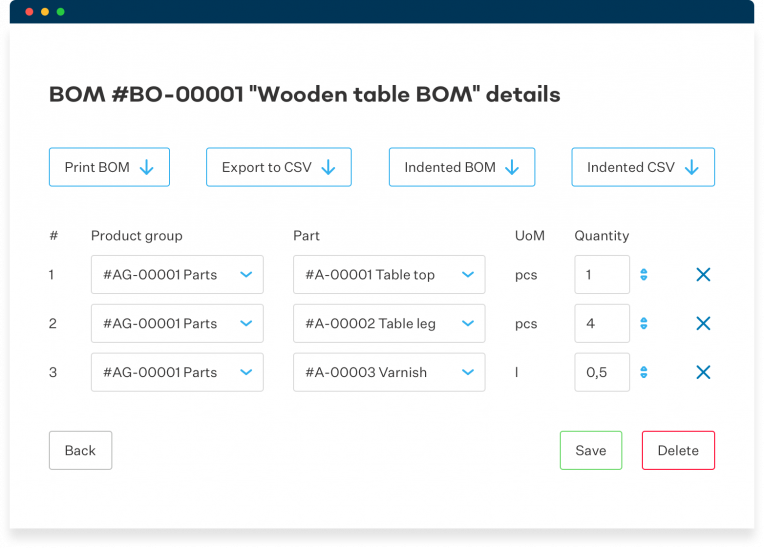 Associate a particular BOM with a particular routing and workstation on a manufacturing order within one solution. Since it’s all managed in one BOM software, you will know the actual cost of the finished products – it’s calculated by adding up the manufacturing operations costs, labor costs and materials costs. 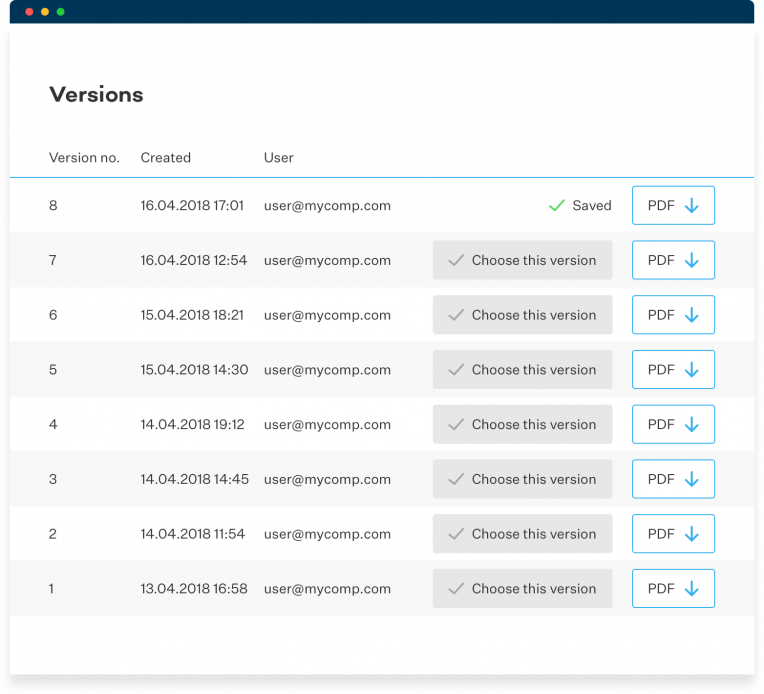 With our Version Control System, stay on top of the Bills of Materials that evolve in time, while keeping the history for all different versions and revisions. Plus, easily distinguish to which revision a physical product actually belongs. When designers and/or engineers publish a new version, then it’s accessible to other co-workers right away, as long as they have an option to check if they are holding the latest version of the document. Use co-product BOM for reporting scrap/waste and for tracking further processing. MRPeasy is simple yet powerful MRP software that helps small manufacturers organize production. Just sign up to test MRPeasy, select the features plan that meets your requirements and access additional functionality as you grow your business.